We interview Busch Gardens Williamsburg's Senior Manager in charge of Howl-O-Scream and talk about some interesting industry news. We start off this week's show with THREE First Drop stories! First up, is news about the new roller coaster coming to Sea World San Diego in 2017 - Wave Breaker: The Rescue Coaster. 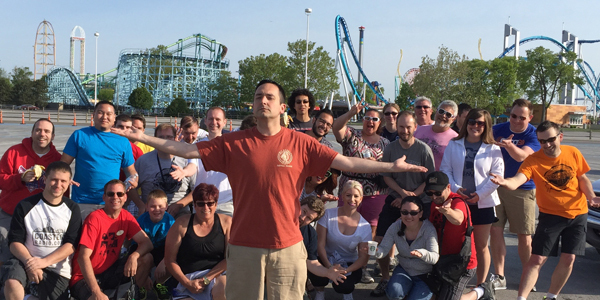 Then, we get into a debate on what is really happening with Mean Streak at Cedar Point. Finally, we review a story about a doctor who found that taking a ride on a roller coaster could cure a person of kidney stones. Heck, we'll even do an experiment live on-the-air to see if it's true. Then, we'll interview Phil Raybourn, Senior Manager of Consumer Event Production at Busch Gardens Williamsburg. Phil is in charge of Howl-O-Scream, so we'll talk with him all about it. We'll also find out about their new Escape Rooms and the new haunted house Circo Sinistro! We'll also have a Live Trip Report from Six Flags Magic Mountain and an Interactive Discussion about Amusement Today's Top 50 Steel Roller Coaster list.